Francisco José de Paula Santander y Omaña (April 2, 1792 - May 6, 1840) was one of the military and political leaders during Colombia's (then known as United Provinces of New Granada) independence struggle (1810-1819) under Simón Bolívar. Santander was Vice-President from 1821 until 1828. Following independence from Spain, however, he found himself increasingly at odds with Bolívar, who held the Presidency. Bolívar wanted a strong, authoritarian centralist state while Santander wanted a federal system. Bolívar supported a Church-state alliance, Santander wanted a secular, liberal state. In 1828, the year that Bolívar declared himself dictator, Santander was accused of complicity in an assassination plot against Bolívar and sentenced to death. A pardon followed, on the condition that he leave Granada. Following Bolívar's death, Santander returned to Columbia and served as President from 1833 until 1837, then in the Senate until his death. Considered Columbia's founding President, his supporters formed the Liberal Party in opposition to Bolívar's Conservatives. Between them, these two political parties have governed Colombia throughout its entire history. Only the United States has a longer history of stable democratic governance in the Western hemisphere. Colombia is the oldest democracy in Latin America. Santander is credited with establishing the rule of law in Colombia, which, although stretched thin by domestic violence and drug-wars, has stood the test of time. His goal of establishing a more egalitarian society, however, has not been achieved. Columbia can honor Santander's legacy by working to make the revolutionary ideals of justice, liberty, and equality become a reality. Santander was born in Rosario de Cúcuta in what was then the Spanish Viceroyalty of New Granada, not far from the Venezuelan border. His father was a plantation owner. In 1810, when the movement for independence started he was studying law at Bogotá. Leaving his studies, he joined the federalist (federalista) cause as a soldier at age 18. The federalists saw themselves as heirs of the Enlightenment and wanted a United States type of federal government. By 1812, Santander was a colonel. After the Spanish Invasion of New Granada, as a series of defeats led to the exile or retreat of many of New Granada's officers, Santander himself retreated to the eastern plains, near the modern Venezuelan border. Operating from there, Santander was promoted to Brigadier General in 1817, under Simón Bolívar. By 1819, he was given command of the republican army's vanguard by Simón Bolívar, as the invasion of New Granada was initiated from the New Grenadine-Venezuelan border. Santander was one of the battlefield commanders during the republican victory at the Battle of Boyacá in August 7 of that same year. After the battle, he was promoted to Division General, the equivalent of a U.S. Major General. In October 1821, after the constitution of Cúcuta was proclaimed, Santander was elected by the newly gathered Congress as vice president of Gran Colombia, in a heated election, where he overcame another strong candidate for the post, Antonio Nariño, by a 38 to 19 vote margin. Simón Bolívar, influenced by Napoleon Bonaparte, favored the centralist (unitarios) option. (Bolívar was impressed with how Napoleon impacted history single-handedly but thought his coronation as Emperor, which he attended, compromised his republicanism. Napoleon's crown was "a miserable thing and a Gothic fancy" but the people's admiration for Napoleon inspired him to hope that he might play a leading role in the liberation of his own nation.) He was President from 1821 until 1830. Since Bolívar, pursuing his dream of a unified South America, decided to continue leading the republican forces towards Ecuador and Peru, the constitution mandated that Santander remain in Bogotá, the capital, and act as the representative of the executive branch of government. Congress voted Bolívar "extraordinary powers" to "secure the liberation" of all "territories still held by Spain." He was, says Lynch, "glad to leave the government of Columbia to the capable, if grim, Santander" and "resume his career as Liberator." As acting ruler, Santander had to deal with the grave economic crisis that was one of the direct consequences of almost a decade of constant warfare, as well as with surviving Royalist sentiments, the requirements of continuing military operations (including recruitment, training, and supply), administrative and legislative reactivation, and internal political divisions. Economically, while Santander was running Colombia for Bolívar, he made a concerted move toward free trade. First of all, he removed and reduced many taxes which had been left in place from the Spanish rule, and opened ports to all foreign nations. He also created incentives for immigrants, including expedited naturalization—one could even leave the country for up to six months without interrupting his required stay—and land grants. Bolívar undid many of Santander's actions after he returned and assumed his position as president. One of these was the that the Universities should "teach legislation according to the principles of Bentham." Bentham believed that democracy was the best system of governance, because the interests of the governed and those of the government should coincide, when the former choose the latter. However, aware that those in power, even in a democracy, can abuse their power he also believed that the public must remain vigilant in scrutinizing how the government represents their interests. Public opinion, expressed at least in part through the media, would act as a "Tribunal." The Tribunal's task is to "evaluate the work of the governors just as the jury evaluates the accused in a trial." Statue of Francisco de Paula Santander in Medellín. Initially, Santander and Bolívar were considered as close friends and allies, but gradually political and ideological differences emerged. It is considered by modern scholars that Santander believed in the sanctity of constitutional government and in the rule of law, perhaps to a greater degree than Bolívar, who would have allegedly thought that those concerns were secondary to what he perceived as the actual needs and solutions that historical circumstances demanded, and thus could be subject to flexibility. The Federalists later became identified with the Liberal Party, while the centralists formed the Conservative Party. The former also stood for Church-state separation, while the latter wanted to privilege the Catholic Church. In 1826, when the first Venezuelan uprising occurred, Santander and Bolívar came to disagree about how to handle the situation. Santander believed that the rebels, led by José Antonio Páez and federalist sympathizers, should be punished or at least made to openly submit to the established constitutional order. 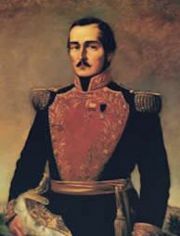 When Bolívar, who had returned from Peru and reassumed his executive powers, arranged for an amnesty and placed Páez as supreme military chief of the department of Venezuela, Santander felt that the central government's authority and the rule of law were being undermined by the constitutional President himself in a personalist manner. Bolívar nicknamed him "man of law." Santander also disagreed with Bolívar's attempt to promote a reform of the 1821 constitution before it was legally permitted (the constitution stated that ten years had to go by), and especially with Bolívar's attempted nationwide implementation of the constitution that he had previously drafted for Bolivia, which among other provisions called for a lifelong presidency with the ability to select a direct successor. In Santander's opinion, this could place the country dangerously close to monarchism. Santander stood for civilest (civilistas) governance, in which "civilian leaders would interpret legislation in the best interests of the citizens" while Bolívar thought that a strong leader was needed in order to "put the chaotic new republic in order." As a liberal, Santander was influenced by such thinkers as Voltaire and Jean-Jacques Rousseau, as well as by Bentham and John Stuart Mill. He wanted to protect "civil liberties and freedom," to "protect material progress and equality" as well as to abolish "any type of slavery." The Utilitarian principle of enabling the happiness of the greatest number of people informed Santander's idea of good governance. However, for both Santander and Bolívar, achieving "justice, liberty and equality" had been the fundamental goal of independence from colonial rule, in the spirit of the French Revolution from which they drew much inspiration. In 1828, growing internal conflicts continued. Santander was elected as one of the delegates to the Ocaña constitutional convention, during which both his supporters and other opposition political factions blocked Bolívar's attempts at reform. This led to the sudden exit of many of the Bolivarian delegates, who disagreed with the Convention's potential outcome. These events eventually led Bolívar to declare himself dictator in August of that year, while the office of the vice president was abolished. Santander and his political sympathizers felt that this act betrayed liberalism and the ideology of the Age of Enlightenment, some even comparing Bolívar to Napoleon or Julius Caesar. In September 1828, Bolívar escaped an assassination attempt. Among those blamed was Santander who, in a quick military trial, was originally sentenced to die without specific proof of his participation in the event. Bolívar pardoned him and his exile was ordered. Even today, the details are not totally clear and the evidence appears to be inconclusive. Some historians consider that Santander knew about the possibility of an assassination attempt and initially opposed it, but eventually allowed it to happen without his direct participation. This position was eventually assumed by Santander himself later in his life. Others consider that Santander may have been involved in the plan from the beginning as it would benefit him politically, though no direct proof of his role has been found. Testament of Francisco de Paula Santander: I declare that I was born in Villa del Rosario de Cúcuta, of the legitimately contracted marriage between my parents Mr. Juan Agustin Santander y Colmenares and Mrs. Manuela de Omaña y Rodrigue,z both already deceased as well as their ancestors of noble family, that under the Spanish government obtained public destinies of honor and distinction. I say this to counter the lies of my enemies, who have wanted to deny me even my birth. After Bolívar died and Gran Colombia broke up, Santander returned from exile in London, in 1832, and served as President of the Republic of the New Granada 1832 to 1836. Santander had spent a great deal of time in Europe studying the Enlightenment. When he returned, these concepts influenced his decisions to a great extent. His second period of control was quite different from the first, in that it stressed an alternate form of proteccionismo. He first reverted most of his original changes from Bolívar's undoing, although some were devalued somewhat. He then stepped up his quest for safety under the wings of industrialized nations, as opposed to discouraging trade with them, even going so far as to insert economic contacts in 11 United States cities. He hoped that by creating strong ties with them, he would avoid the high tariffs he inherently disliked. After his term expired in 1836, he remained an important and influential political figure serving in the Senate. He died in 1840 and was eventually considered as one of the original historical representatives of the Colombian Liberal Party, which would be founded some eight years later. Two years of civil unrest followed his death. Palacios describes Santander as responsible for "constructing the rule of law" in Colombia as Vice-President, and says that the centenary of his death in 1940 was "the apex of a government led civil cult." However, some politicians then launched a "counter-offensive" by embracing the "figure of Simon bolivar—first Santander's mentor, later his mortal enemy." Castro describes him as the "first Hispanic American leader to follow caudillos (military strongmen) and install them as heads of government." The Escuela General Francisco de Paula Santander, a training academy for police, was founded in 1940 in his honor. Santander's respect for the rule of law, for civil liberty and rights helped to lay a solid foundation on which Colombian democracy has been built. Osterling describes Colombia as "second only to the United States" in the "Western hemisphere … in maintaining uninterruptedly a democratic, liberal, bourgeois political system." In part, this stability can be attributed to the early establishment of the two main parties, the Liberal and the conservative, which have "alternated in power" and, despite their different ideologies, have remained strongly committed to maintaining "the democratic system." Osterling says that the main threat to democracy in Colombia stems from the uneven distribution of "wealth and power." Unfortunately, while Colombia's governments have changed hands peacefully without military intervention, (Osterling says that unlike elsewhere in South America, political vacuums that the military might occupy do not occur in Colombia, because "when the grip of the party in power begins n to weaken, the other traditional party immediately replaces it without military intervention.") Osterling (1989), xxi.</ref> power has remained in the hands of an elite, which has resulted in violent anti-government protest, so much so that Colombia has developed a "special psychological type of Colombian national" who is "too readily disposed to violence," which is thus linked with "the search for greater economic equality" and with the "opening up of the political system." Santander's commitment to creating responsible citizens able to exercise self-governance, and to stimulating economic growth that benefits all the people of the state, may still represent political goals that Colombia needs to achieve. ↑ 2.0 2.1 Lynch (2006), 146. ↑ Fred Cutler, Jeremy Bentham and the Public Opinion Tribunal, The Public Opinion Quarterly 63(3):321-346. ↑ 6.0 6.1 Osterling (1989), 173. Bushnell, David. 1970. The Santander Regime in Gran Colombia. Westport, CT: Greenwood Press. ISBN 9780837129815. Castro, Iván A. 2007. 100 Hispanics You Should Know. Westport, CT: Libraries Unlimited. ISBN 9781591583271. González, Roberto. 1996. The Cambridge History of Latin American Literature. New York: Cambridge University Press. ISBN 9780521340694. Huck, E.R. 1972. Economic Experimentation in a Newly Independent Nation: Colombia under Francisco de Paula Santander, 1821-1840. The Americas. 29(2):167-184. Lynch, John. 2006. Simón Bolívar: A Life. New Haven, CT: Yale University Press. ISBN 9780300110623. Osterling, Jorge P. 1989. Democracy in Colombia: Clientelist Politics and Guerrilla Warfare. New Brunswick, NJ: Transaction. ISBN 9780887382291. Palacios, Marco. 2006. Between Legitimacy and Violence: A History of Colombia, 1875-2002. Latin America in translation/en traducción/em tradução. Durham, NC: Duke University Press. ISBN 9780822337546. Safford, Marco Palacios, Marco. 2002. Colombia: Fragmented Land, Divided Society. Oxford: Oxford University Press. ISBN 9780195046175. All links retrieved April 25, 2017. History of "Francisco de Paula Santander"
This page was last modified on 25 April 2017, at 14:49.